I attempted mathematics….but I got on very slowly. The work was repugnant to me, chiefly from my not being able to see any meaning in the early steps in algebra….I do not believe that I should ever have succeeded beyond a very low grade. The inability of Darwin and his followers to make the math of their ideas work continues to haunt them. Another mathematical problem for Darwinism comes in the form of the failing molecular clock hypothesis, a statistical theory of molecular evolution. The hypothesis was the brainchild of arch-Darwinist Schlemiel Zuckerkandl (Zuck for short). “We’re in total discord with the molecular dates,” Wible says. He thinks genetic clocks fail to account for the post-Cretaceous burst of mammalian evolution. The study …may also lead to a number of medical breakthroughs…. That was the first really important surprise about evolution…..
Why is there so much supposed identity in proteins but great divergence in the highly functional non-coding regions? Do the protein coding regions tick at a rate mysteriously out of sync with the non-coding regions? The molecular clock hypothesis is devastated by this fact, hence the great surprise by the scientists (who were blinded by Darwinism). 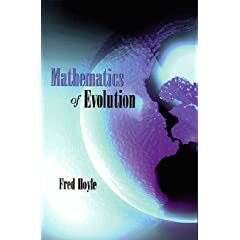 Yet another person vindicated by recent scientific developments is Fred Hoyle, who like Denton and Behe, was critical of the molecular clock hypothesis and its accompanying thoeries of protein phylogeny. Besides which, there are three further objections, one a reductio ad absurdum, another a flaw of logic, and the third a disproof by positive fact, that rule protein phylogenies so far out of court that one must wonder at the state of confusion which led to them ever being considered at all. About this time last year, I also mentioned the potential importance the marsupial and placental convergence and a great opportunity for ID proponents to achieve fame and glory. [See: Marsupials and Placentals: a case of front-loaded, pre-programmed, designed evolution?]. Little did I know the marsupial and placental convergence would also be another boon for ID theorists with respect to the failure of the molecular clock hypothesis, the importance of junk DNA, and the fact ID is more consistent with potential future medical breakthroughs. So it came about from 1860 onward that new believers [in Darwinism] became in a sense mentally ill, or, more precisely, either you became mentally ill or you quitted the subject of biology, as I had done in my early teens. 3. It’s debatable whether the molecular clock hypothesis is Darwinian since it’s principle advocates are neutral theorists. On the other hand Darwinists have often appealed to the hypothesis as if it were their own while concurrently slamming the neutralists. Like so many issues, the relationship of the molecular clock hypothesis to Darwinism is obfuscated into oblivion. But since Darwinists have used the molecular clock hypothesis against ID proponents, it’s fitting its refutation is associated with a refutation of the Darwinists. 4. Zuck wrote anti anti-ID screed which you can find by following links in here. It appears he’s receiving a bit of comeuppance with the recent developments in science. That was the first really important surprise about evolutionÃ¢â‚¬Â¦.. If my naive understanding of science is correct, one important criteria for evaluating the validity of a theory is its predictive power. Why then do Darwinists, whose theory is supported by mountains of overwhelming speculation evidence, seem to spend so much time being “surprised” by new findings? The more data accumulates, the more ID predictions bear fruit and the more Darwinism seems to recoil. It seems that Darwinism thrives primarily in our ignorance of details (where it is much easier to make up stories). When we finally decode the multi-layered “non-functional” regions of DNA, that in my opinion will be the end of Darwinism. Mark my words. Let us not forget that, as Denton so clearly presented in Ã¢â‚¬Å“crisisÃ¢â‚¬Â, if the molecular clock hypothesis is in error then it is impossible to find a naturalistic explanation for the phylogenic tree represented in the cytochrome C gene. Ah yes, I remember this. I recently brought up this problem to a TE friend I have and his reply was that Denton now changed his views (in Nature’s Destiny)! As if that alone was enough to solve the issue! Also, it could be useful for typological classification. Maybe we are meant to organize life-forms, and the designer(s) kindly made the task easy for us to do with precision. Which raises intruiging questions: What lessons are we supposed to learn from comparing and grouping organisms? Are there possible medical/technological secrets to be found in that pattern? Wow, seems like this is really an exciting time to be watching the ID community. Honestly, i am surprised to see some of the difficulties darwinian evolution has- and the blatant disregard by materialists to things that are scientifically valid. (atleast they seem valid to me). Good observation. In fact, we frequently see evolutionists being “surprised” by new findings. Another way evolutionists expressing surprise is this: the evolutionary history of such-a-thing is “more complex than expected”. Often times, they expect to see a tree, but they get bushes. That’s why it’s “more complex than expected”. They say evolutionary “history”. I often take it to mean evolution “story”. Another way evolutionists expressing surprise is this: the evolutionary history of such-a-thing is Ã¢â‚¬Å“more complex than expectedÃ¢â‚¬Â. My favorite Darwinist euphemism for “we didn’t expect that” is “sheds new light on evolution”. Can you believe that exact phrase occurs almost 2,000 times in Google? You have me beat though. “more complex than expected” +evolution occurs almost 10,000 times! “Missing fossils?” What else is new? Ah yes, I remember this. I recently brought up this problem to a TE friend I have and his reply was that Denton now changed his views (in NatureÃ¢â‚¬â„¢s Destiny)! As if that alone was enough to solve the issue! As far as I know, Denton still holds to his critique of Darwinisim presented in “Evolution: A Theory in Crisis”. He was just presenting another view in Nature’s Destiny. Atom, the next time a TE friend brings up “Nature’s Destiny”, point to Denton’s chapter in “Uncommon Dissent”. This was written after Destiny, where he reiterates that he continues to hold his findings in ETIC. Denton is clearly a teleologist. His current “by law” model of design, as presented in Destiny is still seen by him as an ID model — and rightly so. I personally do not by the “by law” argument, I see evidence of agency — but his case for extending the strong anthropic principle well into the scope of biology makes a lot of sense. Gee, I wish I had known Hoyle said that. I and a few other IDists I know have been saying it for years without having known about Hoyle’s comment. I suspect a whole slew of other IDists have been thinking the same. It’s particularly obvious when one has confronted Darwinists in debate many times over. You end up having to question their capacity to reason correctly. I remember one such debate in which my opponent claimed that there are no absolutes. I asked him whether he thought 2+2 (in any conceivable universe) always = 4 and whether that was an absolute or not. He claimed it was not an absolute. He was a very bright young software developer & analyst. So his very livelihood depended on the absolute truths of math. Yet he would not change his mind for anything I could say. His whole world view depended on denial of absolutes. So we can see why a reversal of opinion on his part would have meant a powerful shock to his whole mental life and reason for living – a shock which in religious terms would be called “conversion”. I’ve debated with many like him. The only ones who make the admission of absolutes end up in the theist camp. The very existence of logical absolutes is unaccountable under atheism. That’s why they almost invariably deny them (all while using them as such – go figure). So we see that indeed, atheist/Darwinist thinking cripples the mind and immunizes it against logic and common sense. “There are no absolutes” – Is that an absolute (in all cases true) statement? If yes, then there are absolutes. If not, then in some cases it is not true. Therefore, there are absolutes. If he believes in logic, he believes in absolute truths. That’s what I tried to tell him — to no avail. Strange. It seems that hardly anyone outside physics (except of course for ID people) have thought about absolutes–called mathematical realism (or platonism) in physics circles. Any physicist worth his salt who has thought about it has to concede that mathematical/logical verities are “out there” and that the mind has access to these more in the way of a radio receiver than through the inheritance of a bunch of neurons hard wired by natural selection. Why is it that–though physicists and mathematicians talk about it all the time–one hardly ever encounters a biologist (or anthropologist or linguist) who is even aware of the problem? John Whitfield, “Fossils challenge DNA in the dating game” 10.1038/447894a, p 894-895 v 447, Nature, 21 Jun 2007.